Please note: This content is reviewed every week. If there is an update to the content there will be an asterisk (*) next to the relevant question. Each answer will display the dates when it was last updated and reviewed, e.g. (Updated 01/03/19 | Reviewed 08/03/19). You will need to apply for pre-settled or settled status under the EU Settlement Scheme if you wish to retain your right to live, work and/or study in the UK after the UK has left the EU. If you have already been resident in the UK before the UK leaves the EU, you should consider protecting your status in the UK by applying for pre-settled or settled status under the EU Settlement Scheme now. The settlement scheme is not just for people wanting to stay in the UK indefinitely: it is the best way for current EU national students to preserve their status in the UK regardless of a deal or no deal scenario. If there is a deal, you will need to be resident in the UK by 31 December 2020 and apply by 30 June 2021. If there is no deal, you will need to be resident by the day the UK leaves the EU and apply by 31 December 2020. You will be able to apply for settled/pre-settled status through the EU Settlement Scheme. Please see the EU Settlement Scheme FAQs for more detail. I am a student from the EU/EEA. What does Brexit mean for my place at Imperial? Government has confirmed that EU students starting an undergraduate or postgraduate course in 2019/20 (the first cycle post-Brexit) will still be eligible for home fee status and for financial support as per existing rules. These announcements have not been caveated as being subject a Brexit deal being agreed, and Universities UK has been informed by the Department for Education that these commitments (for England) would be honoured even in the event of no deal. Your right to study in the UK won’t change as a result of Brexit. The government has confirmed that this will also apply to next year’s intake of students (2019/20). The government has stated it intends to continue to allow UK and EU/EEA citizens to travel to each other's countries to study and to work. No, regardless of whether there is a deal or a no deal-Brexit, Government has confirmed that EU students starting an undergraduate or postgraduate course in 2019/20 will still be eligible for UK fee status and for financial support as per existing rules. This means that you will be paying the same fees and have access to the same maintenance and fee loans as UK students, even if the course finishes after the UK has left the EU. A no deal Brexit will not change this. You can find all the latest information on our dedicated webpages for offer holders. Will my tuition fees change as a result of Brexit? The tuition fee status will not change for current EU/EEA students attending UK universities or for those coming for courses starting in 2018/19 or in 2019/20. EU/EEA students studying at UK universities will pay the same fees as UK students for the full duration of their course, even if the course finishes after the UK has left the EU. After the agreed transition period, intended to end in December 2020, the fees for EU/EEA students starting courses at UK universities will depend on the outcome of the UK's exit negotiations. The fee status of EU and EEA students starting courses at UK universities from 2020–21 has not yet been determined by UK governments. If there is a Brexit deal, a transition period will apply and you will not need a visa to enter the UK. If there is a no deal, UK citizens can travel to the Schengen area for stays of up to 90 days in any 180 day period without a visa. EU citizens will be able to enter the UK to visit, work or study after the UK leaves the EU. For stays longer than 3 months, European Temporary Leave to Remain will be required, if you have not previously been resident in the UK. You can find more information in our no deal travel guidance. Can I still apply for Research Council funding for my PhD? Yes - EU nationals can still apply for Research Council PhD studentships at UK institutions for the academic year 2019 to 2020. Can I still receive loans and grants? Will my UK degree still be recognised in the EU? UK degrees are recognised in many countries around the world, and there are a number of agreements between different countries that support this. Some of these are not related to the European Union – for example, the Bologna process. Participation in the Bologna Process will remain open to the UK after the withdrawal from the EU. The recognition of professional qualifications covered by the current MRPQ Directive (architect, dental practitioner, doctor, midwife, nurse, pharmacist and veterinary surgeon) will be at the discretion of member states in case of a no deal. The Brexit White Paper on the future relationship states that the government wants to establish a system on mutual recognition of professional qualifications (MRPQ) that covers the same range of professions as the existing MRPQ Directive. What about Erasmus+ grants and study abroad opportunities? Latest updates on Erasmus+ and study abroad can be found on the dedicated College Erasmus+ site. In order to qualify for settlement under the EU Settlement Scheme (see above), you must not normally have been out of the UK for more than 6 months in any 12 month period. There is an exception to this if you have been undertaking a study abroad year as part of your degree. In this case you must not have been out of the UK for more than 12 consecutive months. You may want to consider returning to the UK early if the length of your study abroad year is going to be longer than 12 months. You don’t need to do this before the UK leaves the EU, but you need to ensure that you have not been out of the UK for more than 12 months before the deadline to apply under the EU Settlement Scheme (30 December 2020 in the event of no-deal or 30 June 2021 if the deal is agreed). If you have not been resident in the UK for 5 years, you can still apply for pre-settlement under the EU Settlement Scheme but only if you are resident in the UK by the date the UK leaves the EU (in the event of a no-deal). Therefore, if you are currently outside the UK you may want to consider travelling back in to the UK before the UK leaves the EU in order to be resident here by the relevant date. If you want more advice on your situation, please contact brexit.advice@imperial.ac.uk. If the UK leaves the EU with a deal, a transition period will apply and all travel will continue as normal. If the UK leaves the EU with no deal, there will be no transition period and travel disruption is expected. Delays are possible at airports and ports, especially around the day that the UK will leave. Please do check before you travel and see our no deal travel guidance note for more information. Yes. There is no immediate change to the UK’s visa policies, including for EU/EEA citizens already living in the UK and for those who wish to come here. Regardless of the outcome of the Brexit process, the UK government has committed to protect the rights of EU/EEA citizens and their family members currently living in the UK. This includes the right to live, work and study here and access public services, such as healthcare, and benefits. To retain these rights, all EU/EEA citizens will need to apply for UK immigration status (either settled or pre-settled status) under the EU Settlement Scheme. Please see the FAQ 'Can I apply for the EU Settlement Scheme' above for more information. If you have already been resident in the UK prior to the day the UK leaves the EU, you should consider protecting your status in the UK by applying for pre-settled or settled status under the EU Settlement Scheme . The settlement scheme is not just for people wanting to stay in the UK indefinitely: it is the best way for current EU national students to preserve their status in the UK regardless of a deal or no deal scenario. You can find more guidance in our EU Settlement Scheme FAQs. I’m concerned about Brexit. What is Imperial doing? 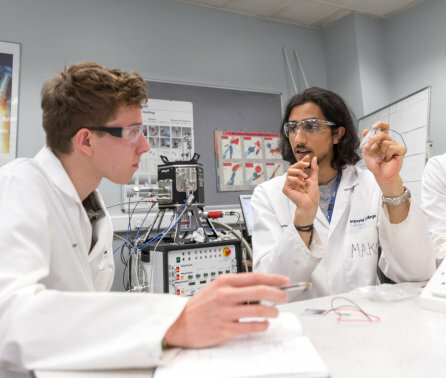 On the morning of the 2016 Brexit referendum result, Imperial’s President Alice Gast made it clear that “Imperial is, and will remain, a European university.” We have lived up to that – and we will do so, whatever political challenges we may face. We are working to influence government, officials and politicians in Westminster and Brussels. We want continued access to EU programmes supporting excellent research, and guarantees on the rights of EU citizens. As the UK reviews its entire immigration system, we are campaigning for visa reforms that will offer easier access for international students and recent graduates. We have formed a seed fund to support new European research collaborations and are developing new European partnerships, such as that between Imperial Department of Mathematics and France’s CNRS research agency and Imperial and the Technical University Munich. Imperial is a European university with global reach. Collaborating across borders with people from different backgrounds, cultures and nationalities is what drives the world’s best universities. It’s why Imperial is the UK’s most international university, and it’s one of reasons we’re among the world’s top ten universities.